A private rocket development company has struck a deal thatcould allow for demonstration launches of its reusable suborbital spacecraft fromFlorida. Masten Space Systems, a privateaerospace company based in Mojave, Calif., announced a partnership withSpace Florida today (Nov. 22) to explore the possibility of demonstrationlaunches from Launch Complex 36 ? a rocket launching pad at the Cape CanaveralAir Force Station in Florida. "We have been looking at Florida as a launch option forsome time now," Masten Founder and CEO David Masten said in a statement. "We are excited to begin the process of determining if Launch Complex 36is a good location for our flight operations, and hope to attempt ademonstration launch sometime in 2011." Space Florida, created by the Space Florida Act, was enactedin 2006 with the goal of fostering the growth and development of a sustainableaerospace industry in the state through research, investment, explorationand commerce. "We are thrilled to have Masten looking at Florida'sSpace Coast," said Space Florida President Frank DiBello. "We viewcompanies like Masten as the catalysts for innovation in our state's aerospaceeconomy. There is significant potential for their launch vehicles to provide avaluable platform for commercial research and development, and we look forwardto working with them to explore that potential here in Florida." "We've had interest from many researchers, scientists,and engineers," said Colin Ake, Masten's Director of Business Development. "We look forward to conducting regular flight operations in the nearfuture, including using suborbital flights as a quality assurance 'checkout'for experiments bound for the International Space Station. 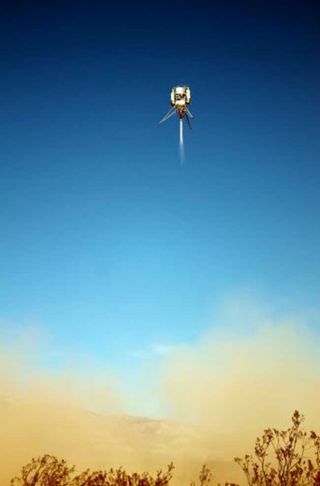 "With itsrockets designed to launch vertically and land vertically, Masten Space Systemsis considered a strong contender in the field of commercialspaceflight. Last year, the company snagged $1 million in NASA prize moneyby winninga contest to build and fly mock lunar landers. Masten Space Systems is one of two private rocket developersthat received NASA funding to test launch suborbital robot rocketships. Thisyear, the company partnered with XCOR Aerospace to build and launch unmannedlanders for missions to the moon, Mars and asteroids. "As our vehicles near completion, we're searching forthe ideal launch location from which to base our flight operations team,"said Michael Mealling, Masten's Chief Financial Officer. "While we arepreparing for a flight demonstration in Florida, there are enough new spaceports around the country that evaluating them will take time. Our ultimate goalis to develop enough market demand to justify flying from multiple spaceports." Meanwhile, both Space Florida and Masten are committed toreducing the cost of rocket launches, and seek to enable greater access tospace. "Everything about our vehicle feeds directly intolow-cost operations with minimal infrastructure," Masten said. "Werequire a small concrete pad and have optimized vehicle operations for a fiveperson team. It's great to find ourselves on the same path and we're lookingforward to exploring opportunities in Florida."